Last week we tested the light weight wheels on the UPR 2011 Project Car and ended up running out of gear on the top end. We had a few options available to us. We could go to a numerically shorter gear such as a 3.55 or a try and find a slightly taller tire to keep us going through the traps in 4th gear. Another option was a taller gear and shift into 5th (1:1 ratio on the new 6 speed transmissions) some seem to think is the best route. The debate on that could go on forever because going into the 5th also means another shift but a taller gear could mean better 60 foots and lower ETs overall. We chose Ford Racing 4.30 gears, which will put us well into the power range of 5th gear at the end of the track and still leave us some room for a power adder if we decide to go that route. With the rear end apart we also swapped out the rear end cover with a UPR Billet Stud Girdle. Unfortunately for us we didnt have the same great weather we had a few days earlier but it was still better than what we usually have all summer. Our last blog ended with the note that we were going to test Jeremys theory on wheel spin/speed. The first run we netted a great 1.70 60 time, yet the car bogged and only produced an 11.92 @ 115.67. On the next run Jeremy decided to further test his theory and launch the car at 6000 rpm which was 500 higher than his previous launch, this would be an aggressive move but would let us know if the 2011 5.0 would benefit from wheel spin. Jeremys theory would prove to be correct with a 1.68 60 time, the car ran 11.75 @ 118.28. Once again only .02 better at the 60 but almost 2 tenths at the stripe. The wheel spin is critical in netting quicker and faster runs. The coyote does not like low rpm or boggy launches. 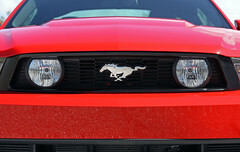 High rpm and controlled wheel spin are both keys to making your 2011 5.0 run fast. Our last run of the night Jeremy wanted to shoot for the moon and launch at 6400-6500 rpm. This would be a great choice with slicks, however keep in mind we are using drag radials. Well the theory was correct again, a 1.66 short time. At PBIR the 60 time is posted directly on the ET clock during the run. Jeremy saw the stellar 1.66 and got so excited that he short shifted 2nd gear and bogged the engine. The ¼ mile time was 11.77. By short shifting 2nd gear Jeremy feels that we lost .07-.09 and this might have been our first run into the 11.60 range. At the time of the 11.75 pass the temperature was 67.8 degrees, 30.07 barometer and the humidity was a sticky 81%. In fact on the video of the car on You Tube you can see the dew built up on the rear window. Even though the time slip doesnt show a better ET just taking in the weather conditions versus the previous outing of 81 feet above sea level compared to 650 from last night Jeremy is confident in the gains from the gears. We feel the gears are worth at least a tenth in the quarter mile. Weather permitting well be able to show those numbers on paper where it counts. Modifications: ARH 1 ¾ Longtubes with O/R X-pipe, K&N Filter, Diablosport Tune, UPR Pro Street Upper Control Arm/Pro Street Lower Control Arms/Adjustable Panhard Bar/Drag Launch Springs, Shelby 18 Wheels w/ MT 265/40/18 DRs. Modifications: ARH 1 7/8 Longtubes with O/R X-pipe, K&N Filter, Diablosport Tune, UPR Pro Street Upper Control Arm/Pro Street Lower Control Arms/Adjustable Panhard Bar/Drag Launch Springs, Shelby 18 Wheels w/ MT 265/40/18 DRs. Modifications: ARH 1 7/8 Longtubes with O/R X-pipe, K&N Filter, Diablosport Tune, UPR Pro Street Upper Control Arm/Pro Street Lower Control Arms/Adjustable Panhard Bar/Drag Launch Springs, Bogart GT 15 Wheels w/ MT275/50/15 DRs. Finally here in South Florida we get a bit of cooler weather to give us a break from the typically oppressive 90 degree days and 80% humidity. The good weather also means better racing conditions for the UPR 2011 Project Car. If you havent followed our previous blogs, the purpose of this car isnt to be the first, but instead to show the gains from modifications a customer might do or might want to do. Want to see more photos? Click here to see our continuously updated photostream! To date the best ET to date is 11.90 @ 117.57 with a 1.71 60 foot time. At the time of the previous best we were using stock 18 Shelby wheels with 265/40/18 DRs. For this week we wanted to test out a lighter wheel with bigger sidewall drag radial to show the cost benefit of that particular set up. We used the 15 Bogart GT wheels from our 2009 Shelby Project car and went with a 275/50/15 MT DRs out back to keep the tire height about the same as our 18 DRs. The wheels dropped about 100lbs of rotational mass from the car. First pass down the track Jeremy matched our best 60 time with the old wheel/tire combo with a 1.71 and went an 11.91 @ 116.89. Although the tire size was very close in overall height they were just short enough to cause Jeremy to run out of gear a good 50 feet shy of the traps affecting the MPH. On the next pass gave us what we were hoping for an 11.71 @ 116.86 and a 1.69 60 foot time again bumping the limiter shy of the traps. Last pass of the night was an 11.84 @ 117.03 and a 1.74 60 foot time due to a little bit too much wheel spin off the line. The weather played a part in the better ETs as the DA at the time of our 11.71 pass was 81 above sea level (after correcting for weather). Jeremy felt the weather was worth 8 to 9 hundredths and the lighter wheels accounted for the other tenth of a second. With only 2 hundredths better in the 60 time, one would think a gain of .4 or .05 would be the norm for the ¼ mile gain. 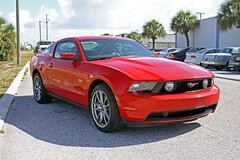 On the 1.71 60 run the 2011 Mustang had wheel spin for approximately 10 and when it gained traction, the engine bogged. The bog killed the momentum of the run and netted the 11.90. On the 1.69 60 run the stang had controlled wheel spin which kept the engine rpm up, thus not allowing the engine to bog. Jeremys opinion is that the engine needs to remain above 5500 rpm in order to produce quicker track times. We will put Jeremys theory to test on our next outing. Its been a while since our last post about our 2011 Mustang GT but we took some time to make changes to the car and get the most out of them. We also fought through the now notorious clutch issues that the 6 speed cars seem to have having. Jeremy had experienced the pedal sticking to the floor on wide open throttle shifts and eventually some clutch slippage. Before that was addressed we wanted to change out the 1 ¾ American Racing Headers for the 1 7/8 headers to truly see if you need such a big header. Prior race experience has shown going with such a large header on a small cubic inch engine just wasnt justified but we wanted proof. Soon as we got the headers changed out it was right back to the dyno with no changes to the tune at first. The results were surprising to say the least. Our peak power dropped 4RWHP down to 440RWHP BUT we picked up as much as 30RWHP in the mid range of the power band. From just above idle till just before peak power the 1 7/8 headers picked up over the 1 ¾. The average power was up about 15RWHP throughout the power band. Ken Bjonnes of Diablosport massaged the tune to see if anything could be improved over his previous tune for the 1 ¾ headers but very little was picked up. The curve was a little rough and we tried going to an adapter and conical filter instead of the drop in K&N filter. This helped smooth out the power curve but didnt really pick up power. With the headers tested it was time to get back to the track but first the clutch had to be addressed. We chose the Mcleod RXT, as they sponsored Jeremy throughout his racing career. At the same time we also switched out the two piece driveshaft for to one piece aluminum driveshaft from Axle Exchange. 200 miles were put on the new clutch to give it some break in before taking it out to the track. For testing at the track we are running 18 factory Shelby wheels all around with Mickey Thompson 265/40/18 Drag Radials. Hot lapping the car, never took the helmet off, the first three passes resulted in 12.17, 12.05 and an 11.92 @ 117.92 in fact all the passes were at 117 MPH. On the 11.92 pass we had a 60 foot of 1.77, the same as our previous best at 12.16 @ 115.37 but a solid 2 tenths and 2 MPH faster. We let the car cool for 45 minutes and made two more back to back passes playing with launch RPM to get some better 60fts out of it. The last two pass resulted in an 11.91 @ 117.75 with a 1.76 60ft and an 11.90 @ 117.57 with a 1.71 60ft giving us a new best for this combination. The last pass was odd in the fact that the 60 foot was 5 hundredths quicker than the last pass but only picked up 1.5 hundredths on the top end. Jeremy feels that the slower 60ft times had slight wheel spin and did not bog the engine. On the 1.71 pass the car dead hooked and bogged the engine. By doing double duty, driving both the UPR car and the Lethal Performance 2011, Jeremy has been able to help us learn what works best for the 2011 without wasting time or money. The evolution of UPRs 2011 has proved to be an interesting learning experience, as we have spent under $2,000 and now have a solid 11 second Mustang. The weather at the time of the last pass was 76.8*, 30.02 barometer and 84% humidity giving us a DA of 1,378. With some cooler weather not far down the road and better 60fts we could easily see some mid 11s in the near future with a stock weight car (well only an Aluminum driveshaft) and a couple bolt ons. Since getting some seat time at the track with the new 5.0 Mustang and some baseline numbers in stock form and with SCT tuning we were ready to make some changes. Before we had made 400RWHP with just an SCT tune in the car and we backed it up with a 397RWHP at peak, 297RWHP average. Next we had a set of 1 ¾ American Racing Headers installed and matching Offroad X-pipe. We wanted to try the smaller diameter primaries first and see how it worked. We will be testing the 1 7/8 here shortly. We left the SCT tune in the car and put the car on the dyno with the new exhaust and after verifying the A/F was good we saw a best of 418.89RWHP at peak, 313.25RWHP average. Roughly thats a gain of 22RWHP at peak and 16RWHP average. Ken Bjonnes of Diablosport came by the shop to do some testing of the Trinity Tuner and tuning on the car to see if there was room for improvement and the improvements were more than any of expected. Four pulls were done, during which time a K&N drop in filter was added and the car made 444.58RWHP at peak and 358RWHP average. Thats a gain of 25.69RWHP at peak and 44.75RWHP average from just the tune. Now it was off to the track to see how the new found power would translate on the track. The last time out we ran a best of 12.54 @ 112.63 with a 1.91 60 foot time on the stock 19 radials. The car was fighting for traction so we wanted to switch to drag radials. Given the limited availability of 19 drag radials we took the stock Shelby GT500 wheels from our 2009 and put them on the car along with a pair of 265/40/18 Mickey Thompson Drag Radials. This way we keep the car as true to a full weight street car as possible. Jeremy Martorella took on the driver duty and first pass of the night with a 2500RPM launch the car went 12.23 @ 115.47 with a 1.84 60 foot time. Next pass (best of the evening) was a 12.16 @ 115.37 with a 1.77 60 foot time with 4000RPM launch/slipping the clutch. The track started to get a loose from here on out and the next two passes got us a 12.22 @ 116.20 w/1.85 60 foot and a 12.18 @ 115.84 w/1.81 60 foot before calling it a night. There is certainly more in the car the way it sits through the launch and shift points but definitely a successful night at the track. The Density Altitude (DA) at PBIR last night was 2,115 at the time of our 12.16 pass. Nothing like the cooler, drier conditions the shops up North get to enjoy. The latest UPR project was picked up from Weikert Ford in Lake Wales, Florida and brought to the shop to begin test fitting and testing out parts. The purpose of this car is to test bolt on parts, to see how each one does and not just slap on everything available to prove a number. We are going to document and test everything we can, showing the dyno and track results with each. With 202 break-in miles on the odometer, the car was pulled on the dyno with the 87 octane in the tank from the first fill up. First few pulls were done with the car in stock trim with no cool down and temps in the 103-105* range all afternoon. Our third pull on the dyno gave us our best numbers with 385RWHP and 359RWTQ (SAE), our other pulls varied +/- 5RWHP/RWTQ. Next we added an SCT base tune using an Xcal3 and Jeremy Martorella making adjustments from there. The car responded to the tune right away but with the 87 octane still in the tank it would detonate if pushed too hard. Our best pull with our custom tuning was 400RWHP and 388RWTQ (SAE) and there was more to be had. The dyno bay was 105*, engine coolant temp was 220* and air intake temps were 115*. With those kinds of conditions timing was being pulled out on the top end so we called it a day. Next time we will be using 93 octane. Dyno numbers are nice and typically are best for before and after numbers for modifications but the real results are at the track were the numbers dont lie. With a 3 hour break between the dyno and the track we dropped the air pressure down to 28 psi in the rear tires and made a pass in stock trim. This first pass netted a 12.84 @ 111 with a 1.94 60 foot time on the factory Pirelli P Zero 19 tires. Although Palm Beach International Raceway is only 5 above sea level the weather conditions are less than optimal for racing. At the time of that pass the temperature was 88*, humidity 66% and barometer 30.00, which gave us a Density Altitude (DA) of 2142. Corrected times dont really count but give a good gauge when comparing to cars racing up North in more optimal conditions. Our corrected time for stock trim was a 12.54 @ 113.98. Next we put our UPR custom tune back in the car that we tested on the dyno earlier in the day. We left the air pressure the same in the tires and took another shot after a short cool down. This pass netted us 12.54 @ 112.63 with a 1.91 60 foot time. At this point the sun was down and things started to cool down so it was only 85*, 76% humidity and 30.01 barometer giving us a DA of 1963 on that pass. The corrected time worked out to a 12.27 @ 115.10. Needless to say the car was getting lots of attention as the times were very impressive for such a stock car. We made two more passes but the track and weather conditions got worse as more people showed up and we did not surpass those times. There is a fine line with the stock tires and a few hundred RPMs was the difference between minimal spin and frying the tires. Our goal is to provide our customers with accurate information on which parts will improve the performance of their new 5.0. Above all we want to retain 100% drivability and maintain the well-balanced driving experience the incredible new 5.0 Mustang offers. We at UPR Products are well of competitors that are butchering these beautiful new cars for the sole purpose of drag strip ET bragging rights. UPRs racing accomplishments speak for themselves. But we will use our knowledge gained from our racing program to maximize performance in the new 5.0 without detracting from its wolf in sheeps clothing persona. And we will do it all step by step.